Then we got a call, Roger and I, inviting us to come and play in LA on American Idol, with the two finalists, one of whom was Adam. So we went over and did our live dramatic heroic entrance with these two boys, and it really was a fun experience. They were both good singers and both had a good presence on stage, and it was easy to interact with them. But it was really blindingly obvious that there was a chemistry already between us and Adam. It just happened completely naturally and made us all smile. The public reaction was massive, and so I think from that moment the idea of us working with Adam was seeded in our brains. It was not to happen for quite a while, though, because Adam, in common with most of the contestants on these programmes, was signed up following the competition, which, incidentally he didn’t win. But of course that made no difference. 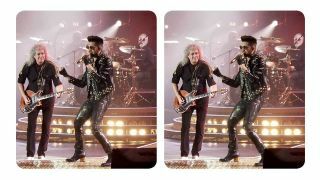 Adam was already perceived as a star by his fans and the media and that’s without Queen having anything to do with it. The thing snowballed very quickly, and we started a long and very fruitful association with Adam in which he has become one of us, part of our family. He’s never attempted to be Freddie, and I think that’s what endears him to the fans, apart from the fact that he is an extraordinary singer with an extraordinary presence. Roger and I have seen literally thousands of singers in our lifetimes including some great ones auditioning for our We Will Rock You show (which, did I mention, ran for 12 solid years in The Dominion Theatre on the Tottenham Court Road in London?) but we’ve never seen or heard anything like Adam. I always think that Freddie, with a wicked smile, would say something like “I hate you, Madam Lambert,” because even Freddie would have been gobsmacked at his range and his ability to reinterpret these songs which the four of us originally created together. There are people out there who think it’s something quite unforgivable that we should be touring at all. They think we should pack up our gear and go into an old people’s home. But it’s been very obvious that not just the old folks, but at least two new generations around the world have absolutely latched on to Queen music, and love it, and have woven it into their lives; and they love seeing us play it live with this ‘boy’. He is a little older now, but still a boy compared with us old rockers. But the age difference doesn’t matter. We have the same work ethic, the same enjoyment of the material, and in these arenas and larger places that we’ve played all I see are happy faces, people who feel, like us, that it’s a privilege to share these kinds of moments, long after Freddie has gone. And – my God – it’s fun! This is excerpted from Queen in 3-D by Brian May, published by the London Stereoscopic Company. It’s on sale now priced £50. Slipbound and featuring 300 3D photos, including previously unseen pictures of Queen, the book also comes with the Owl Viewer, a device designed by Brian May for viewing stereoscopic images. Selected images from the book can be seen below. Queen + Adam Lambert are currently on your in the UK. Tickets are on sale now.